The amazing weather that we have been having the last few days reminds me of why I love and live in Cairns. Taking advantage of this weather MS and I decided to go for a drive up the range and head to Kuranda. Why oh why would I want to go to Kuranda you ask? To go to the German Tucker Wursthouse of course. I am one to avoid the little town of Kuranda since it is a bit of a tourist racket and nothing really interests me up there, except the food of course. Another card in the nifty Table 52 pack of cards, which I am absolutely powering through the GTW is across from the park in the main area of shops in the village and packed with people. There is a takeaway grill out the front of the restaurant for walkers-by but we chose to go inside and sit at a table to eat our tasty German Sausages. Being the big man that he is MS ordered two ‘hotdogs’ – one with a Kaseknacker sausage (beef/cheese/smoked/spices) and one with a Thuringer Bratwurst sausage (beef/pork/herbs/pepper/salt/spices). 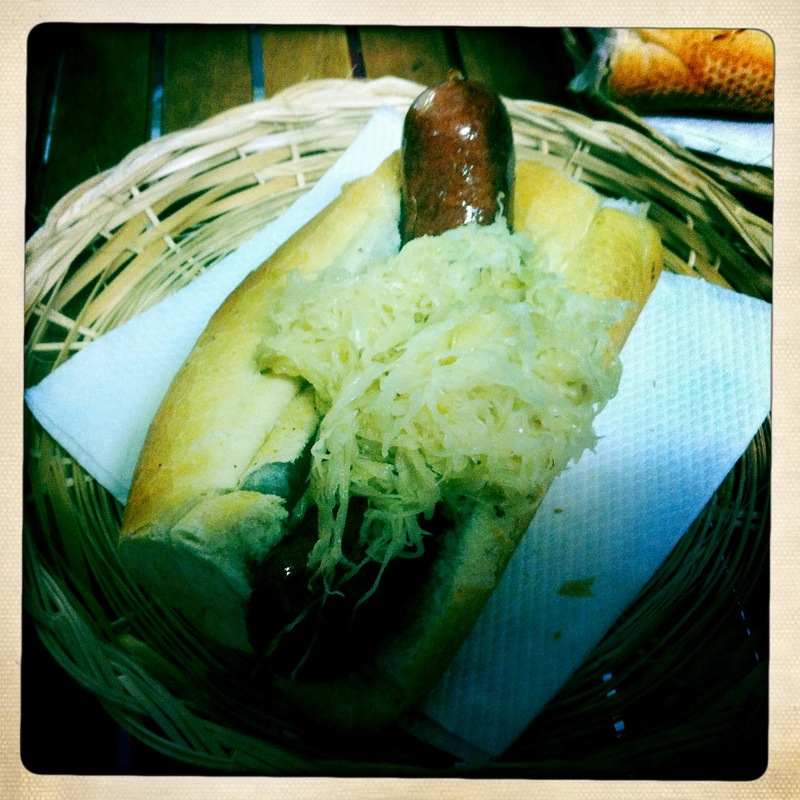 And me being the little person that I am ordered just one hotdog – a Kaseknacker sausage with sauerkraut. The more sauerkraut the better! I could shower in that sh*t it’s so damn good. Controlled chaos seems to be right at home at the GTW however the owner Patric (the man on the grill) doesn’t miss a beat. Seems at the GTW they rely on the honesty system but if you are not honest don’t think he won’t notice. When you arrive at the restaurant you order your food from Patric (he writes nothing down just somehow remembers it all), grab your drink out of one of the fridges, take a seat and wait for him to bring the hotdogs to you, paying when you leave. MS and I observed a large group of tourists eating hotdogs at a table next to us each with a beer in hand. Upon leaving they went to the register to pay for their meals and ‘accidently’ left off a beer when reciting what they had. That didn’t fly with Patric. He was well aware of how many beers they had consumed and called them on it. And here I was thinking he was just a crazy German with a pair of tongs in his hand. He’s obviously a lot more attentive and good at this ‘running a restaurant’ stuff than I thought. That’s a joke. Anyway back to our sausages… On each table there is a bottle of tomato sauce and a bottle of mustard because every good hotdog has to have mustard and tomato sauce on it. The two cheesy sausages (Kaseknacker) arrived first since the Bratwurst was still cooking. MS opted for onion since he doesn’t like sauerkraut and I skipped the onion since I don’t like onion. 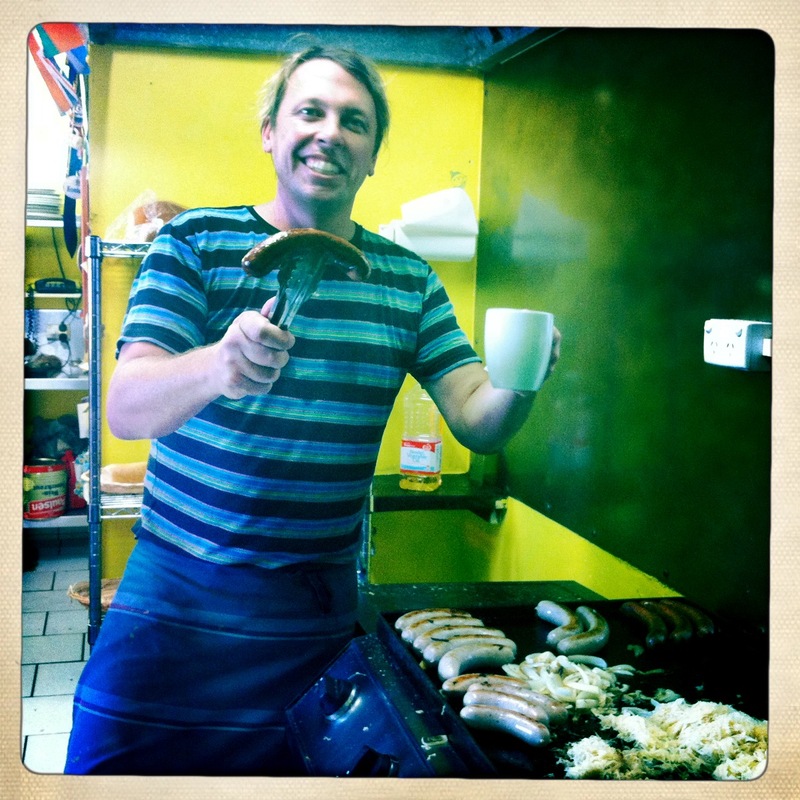 The hotdogs arrived on simple woven basket type plates served by Patric with a smile. 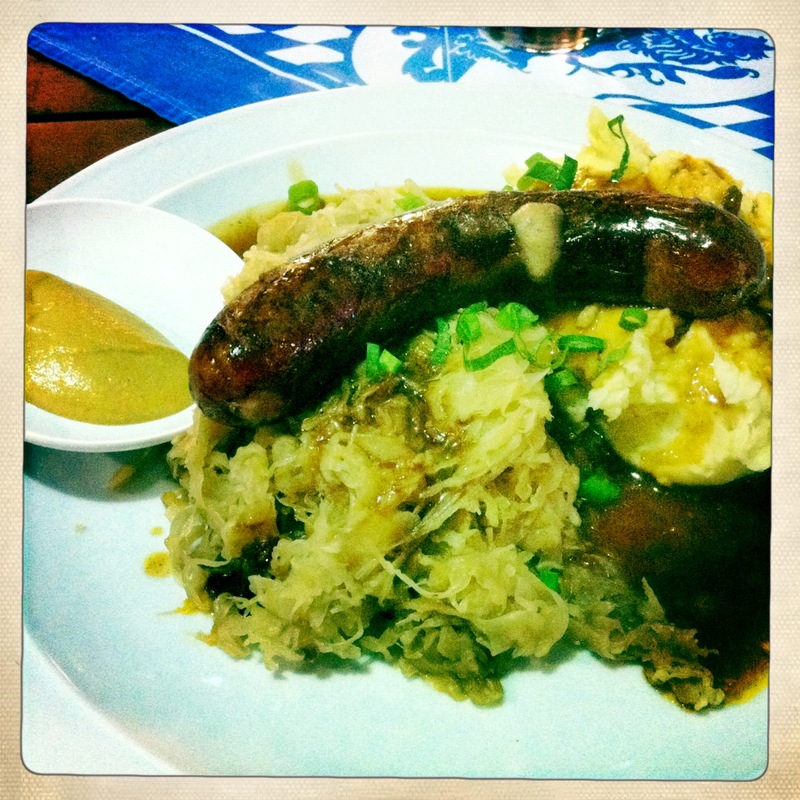 The sausages were big, juicy and firm, the bread rolls were fresh and crusty and the sauerkraut was gooood. MS thought that the bread rolls were too crusty and claimed they were ‘sharp’ and cut into the inside of his mouth. Poor little lamb. I didn’t see a problem with the crustiness of the bread rolls but hey who I am to comment. 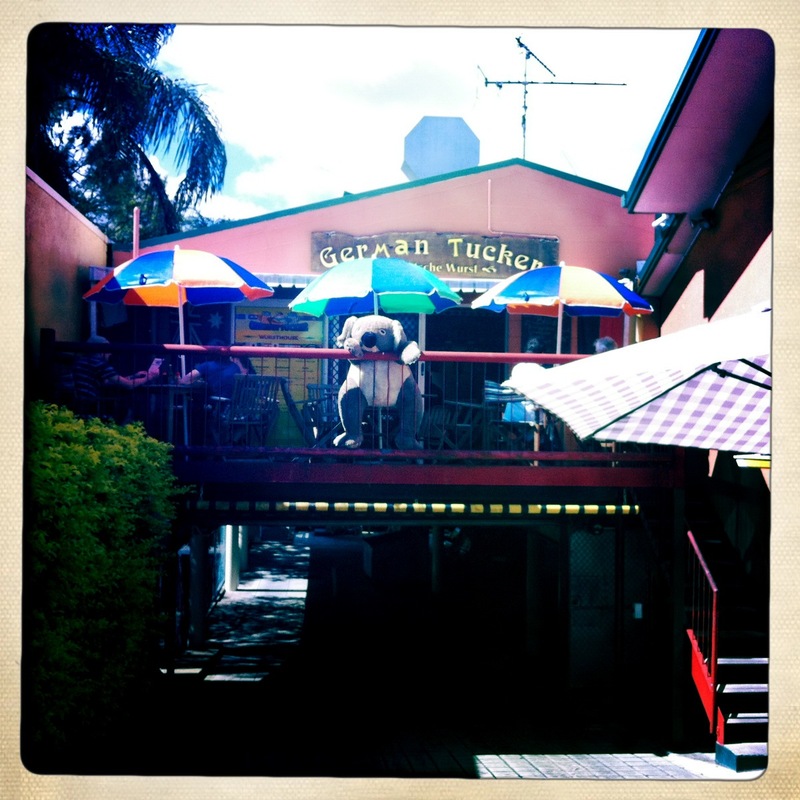 Our little trip up to Kuranda solely to go to the German Tucker Wursthouse was well worth the visit and with our Table 52 card cost us less than AU$20 for the two of us. It’s a great little place with a lot of character, a crazy looking but super friendly owner called Patric, super tasty sausages and mountains of sauerkraut for all you sauerkraut lovers out there. But seriously who doesn’t love sausage in and around their mouth? Get to Kuranda STAT. Got a craving for sauerkraut? Then maybe you should try out the relatively new German restaurant opened up on Spence St so aptly named The Bavarian Beerhouse. Two of my friends and I tried it out last Thursday night and found the place to be well worth the visit. The service was fast, enthusiastic and authentic with all of the wait staff being fluent in German and dressed in the traditional lederhosen. 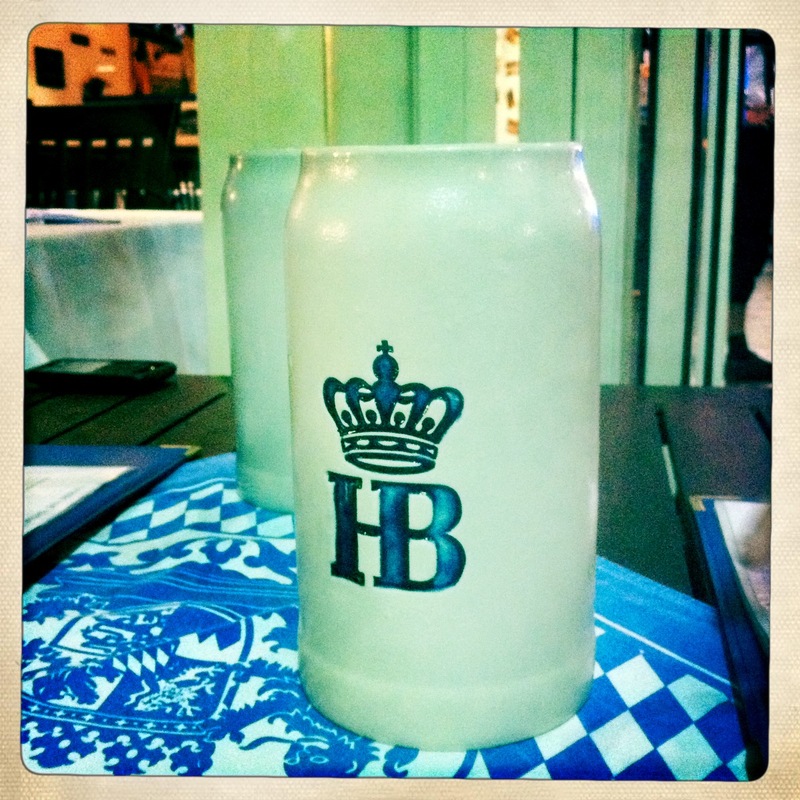 My two friends CM and MJ ordered a 1L stein of beer each, which the waiter told us is imported from Munich in barrels. I opted for a risque glass of water rather than the beer since I’m not really a beer drinker and I was driving. Only two other tables were occupied by diners on this particular Thursday night but I have driven past many times and noticed that it has been very busy mostly on the weekends. 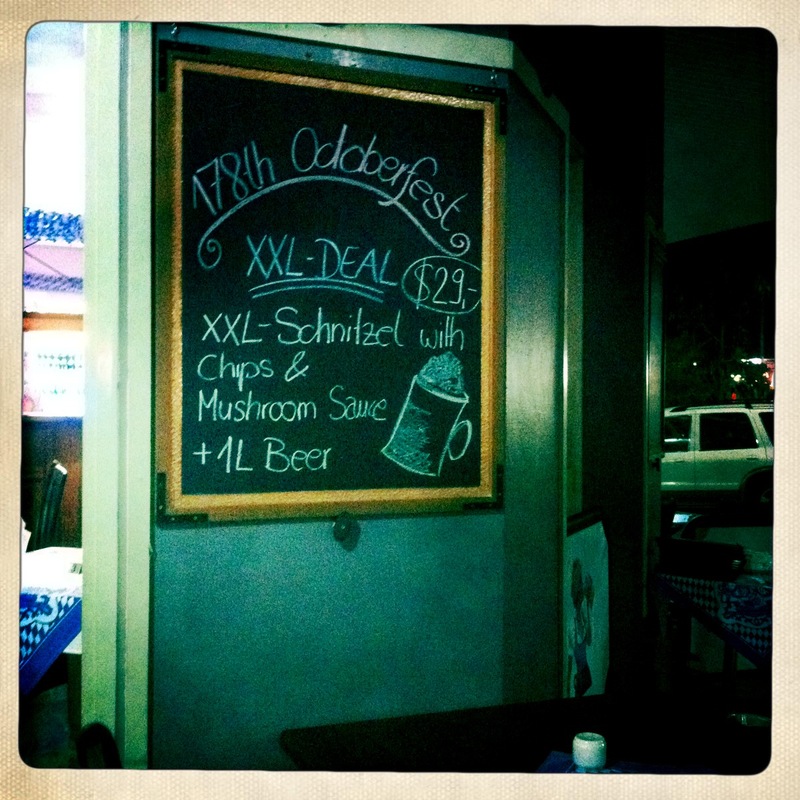 CM and MJ both ordered straight from the specials board – an XXL Schnitzel with Chips, Mushroom Sauce and 1L of beer for AU$29 (that would be their 2nd litre of beer for the evening) while seeking to satisfy my odd craving for sauerkraut I ordered the Kilsekransky, a Grilled Cheese Kransky served with authentic German Sauerkraut, Mashed Potatoes and Bavarian Mustard (a bank breaking AU$9.50). We didn’t wait long for our meals to arrive and when they did we were all pretty staggered at the size of the schnitzel. Well, the special board did say XXL! CM managed to polish off the entire thing as well as 2L of beer minus a few stray chips left on his plate while MJ struggled to finish it all. They both reckoned it was a pretty good deal and enjoyed it although they did say that the schnitzel was a little bit tough and chewy in parts and they also suspected that the mushrooms in the mushroom sauce may have been tinned. I managed to more than satisfy my craving for sauerkraut since my meal came with a massive pile of it! I was pretty wrapped about that and pretty happy with my meal in general as it was super tasty. It was quite a big feed and I couldn’t finish it all as much as I tried. Great value for $9.50! My two friends and I enjoyed our hearty meals and we were all very impressed with the attentive service and the authentic staff. 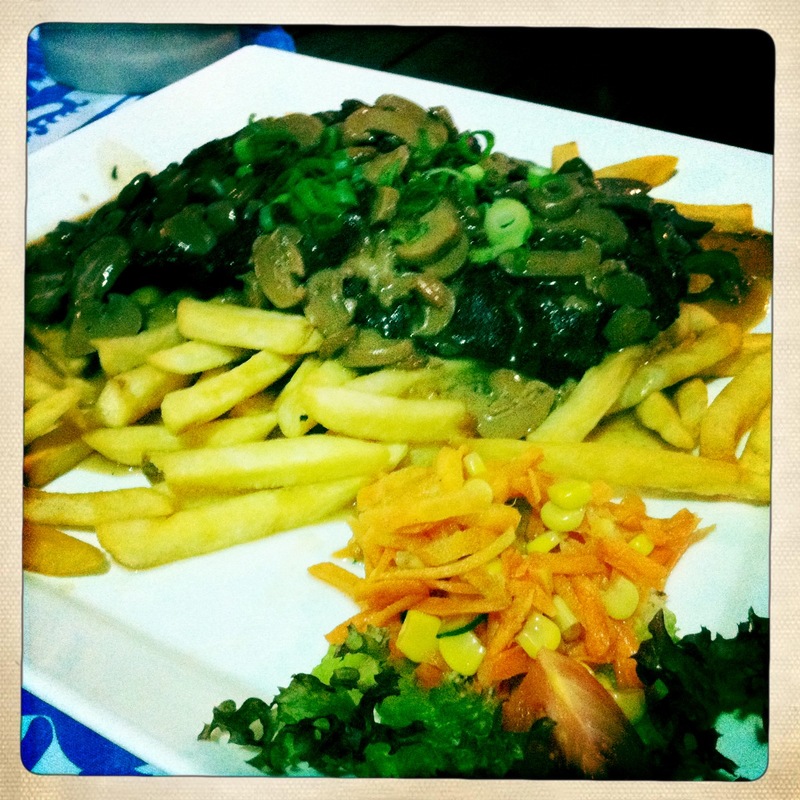 I have only heard good things from other people that have dined at The Bavarian Beerhouse. It’s difficult times to be opening a restaurant in Cairns especially considering the fate of the last restaurant that occupied this corner (Wink) but I am really hoping that this restaurant does well and by the amount of people that I have seen dining here over the last few weeks I think The Bavarian Beerhouse will be here to stay. I’ll be back.